Locoid Lotion was recently introduced at the Summer American Academy of Dermatology Meeting, in Chicago, Illinois, for the treatment of mild-to-moderate atopic dermatitis in pediatric to adult patients. Triax Pharmaceuticals, LLC, the marketers of Locoid Lipocream (hydrocortisone butyrate 0.1%) a leading mid-potency brand in corticosteroids, recently launched the new product to cover larger and hairy affected areas with an elegant, non-greasy application to treat atopic dermatitis. Locoid Lotion has unique properties, and is an ideal product for certain hard to treat areas such as the chest, the arms, and the legs. A new product to treat atopic dermatitis in adult to pediatric patients as young as three months of age was recently introduced. Locoid Lotion, launched by Triax Pharmaceuticals, LLC - the marketers of the leading mid-potency corticosteroid brand Locoid Lipocream (hydrocortisone butyrate 0.1%) - is a new lotion vehicle especially designed to cover larger and hairy affected areas with an elegant, non-greasy application to treat milt to moderate atopic dermatitis. 1. Atopic dermatitis (AD) is very common in the United States. It affects nearly 15 million people (1% to 3% of adults and 10% to 20% of children).1, and accounts for 10 to 20 percent of all visits to dermatologists. The key symptom is pruritus (itching), leading to the description of AD as "the itch that rashes." Itching is fairly constant during daytime hours and worsens at night, causing sleep disturbances and discomfort. For parents of children with AD, it is the number one reason for days of missed work in the United States and it is a common cause of workplace disability for all adults. People who live in cities and in drier climates appear more likely to develop atopic dermatitis.2. Locoid Lotion and Locoid Lipocream have been formulated with high concentration of barrier-enhancing lipids. This unique feature provides skin barrier restorative properties for a wide range of patients. Locoid® Lotion is the ONLY class 5 corticosteroid indicated for pediatric patients 3 months of age and older. It has been proven to provide significant relief of all AD symptoms in pediatric and adult patients. In 89% of patients, symptoms of skin-barrier disruption were eliminated or reduced to mild. By Day 8, average pruritis-symptom scores were reduced to less than mild2. Easy to apply and rapidly absorbed, which in turn, makes it easy to spread over affected areas, including large and hairy areas. The cosmetic acceptability promotes patient compliance3. Promotes hydration and enhances penetration of the active drug. Non-halogenated, which allows for low risk of potential side effects. Unlike the majority of topical corticosteroids, Locoid® Lotion contains no irritants such as propylene glycol, lanolin, or imidurea and is formulated in a non-irritating and fragrance-free base. Dr. Adelaide Hebert, a dermatologist based in Houston, Texas remarks, "Locoid Lotion has unique properties, and is an ideal product for certain hard to treat areas such as the chest, the arms, and the legs." 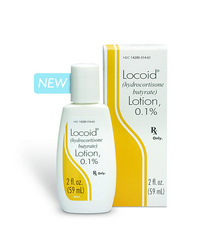 Locoid® Lotion is available by prescription through pharmacies nationwide in a 2 fl. oz. bottle (4 fl. oz. to follow soon). Reversible HPA axis suppression may occur with the potential for corticosteroid insufficiency. Consider periodic evaluations for HPA axis suppression if applied to large surface areas or used under occlusion. Systemic effects of topical corticosteroids may also include manifestations of Cushing's syndrome, hyperglycemia, and glucosuria. Pediatric patients may be more susceptible to systemic toxicity due to their large skin surface-to-body-mass ratios. Initiate appropriate therapy if a concomitant skin infection develops. Discontinue use if irritation develops. Triax Pharmaceuticals is a specialty pharmaceutical company with integrated sales, marketing, and development expertise that markets a portfolio of branded dermatological products. Triax focuses on marketing dermatology products in the United States. Triax sales force is comprised of dermatology sales professionals nationwide. Triax Pharmaceuticals, LLC recently launched its fourth product, Locoid® Lotion . Tretin-X® (tretinoin) Kit is available in 0.025% cream, 0.05% cream, 0.1% cream, 0.01% gel, and 0.025% gel. Each kit contains Tretinoin cream or gel along with two cosmetic products included at no additional cost to the patient: T3™ Foaming Cleanser and T3 Soothing Moisturizer. Minocin® (minocycline HCl) Pellet-filled Capsules Professional Acne Care (P.A.C.). The MINOCIN PAC system contains a 60 count bottle of Minocin Pellet-Filled Capsules (50 mg or 100 mg) and three skincare products (at no additional cost to the patient). 1Matheson R, Kempers S, Breneman D, et al. Hydrocortisone butyrate 0.1% lotion in the treatment of atopic dermatitis in pediatric subjects. J Drugs Dermatol. 2008; 7:266-271. 3 Fowler JF Jr. Hydrocortisone butyrate 0.1% cream in the treatment of chronic dermatitis. Cutis 2005; 75:125-131. For more information on Locoid® Lotion for adult to pediatric patients with atopic dermatitis, please contact Peter Volk or Aleen Hosdaghian of Triax Pharmaceuticals, LLC, 908.372.0500. See http://www.locoid.com for full prescribing information.